Yumka Dechen Gyalmo (Tib. ཡུམ་ཀ་བདེ་ཆེན་རྒྱལ་མོ་, Wyl. yum ka bde chen rgyal mo) — the peaceful dakini practice from the Longchen Nyingtik, the terma revelation of Jikmé Lingpa. Tulku Thondup explains that Yumka Dechen Gyalmo is a sadhana practice on Yeshe Tsogyal, the consort of Guru Rinpoche, as a wisdom dakini. It is one of the three roots practice of the Longchen Nyingtik together with Lama Rigdzin Düpa and Yidam Palchen Düpa. In 1774 the omniscient Jikmé Lingpa visited the Tsogyal Lake. There, amid wondrous signs, he beheld the face of the Wisdom Dakini. He also received the symbolic scripts which he deciphered in order to produce the practice text. Through this practice one understands the dakini Yeshe Tsogyal to be the embodiment of the three kayas. 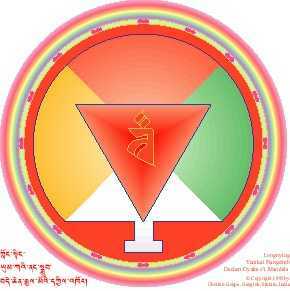 Externally she is Yeshe Tsogyal in the world of the nirmanakaya. Longevity Empowerment for Yumka, the Queen of Great Bliss, by Pema Gyepe De (yum ka bde chen rgyal mo'i tshe dbang) (Shechen Nyingtik Döncha). Arranged based on the root text. Rain of Accomplishments, A Concise Fulfilment for the Female Awareness Holder Practice, by Jikme Lingpa (rig 'dzin yum ka'i bskang bsdus dngos grub char 'bebs) (Shechen Nyingtik Döncha). 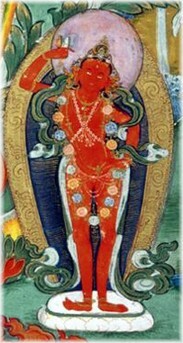 Ratön Ngawang Tendzin Dorje (a disciple of Jikmé Lingpa), Illuminating the Meaning of Tantra: A Commentary on the Sādhana of Yumka, the Queen of Great Bliss or in short the Ratik commentary (yum ka bde chen rgyal mo'i sgrub gzhung gi 'grel ba rgyud don snang ba) (f. 107), written in 1801. Dodrupchen Jikmé Tenpé Nyima, Stairways to Omniscience: A Commentary on the Root Mantra of Yumka, the Queen of Great Bliss (yum ka bde chen rgyal mo'i rtsa sngags kyi 'grel bshad rnam mkhyen bgrod pa'i them skas) (f. 6). Lingtul of Wang­da, Golok (a disciple of Alak Dongak Gyatso), A Concise Commentary on the Yumka Sādhana Ritual, (yum ka'i rtsa sgrub kyi cho ga'i bsdus 'grel) (f. 14). Sangye Özer of Gyarong (a disciple of Khenpo Chechok), Dispelling the Darkness of Ignorance: A Guide to the Sādhana of Yumka, the Queen of Great Bliss (yum ka bde chen rgyal mo'i sgrub gzhung gi zin bris rmong pa'i mun sel) (f 19). Gönpo Tseten of Amdo, A Beautiful Garland of White Lotus Flowers: A Word by Word Commentary on 'The Glorious Garland of Great Bliss: The Root Sādhana of Yumka, the Queen of Great Bliss' (yum ka bde chen rgyal mo'i rtsa ba'i sgrub pa bde chen dpal phreng gi tshig 'grel pad dkar phreng mdzes) (f. 63). Included in sngags mang zhib 'jug vol.8, Ngak Mang Institute, 2003. Also in mgon po tshe brtan gsung rtsom (W1KG6254), mi rigs dpe skrun khang, 2010, pages 110-148. Gönpo Tseten Rinpoche writes in the colophon that he composed this commentary on the request of some American students. He further adds that it is concise and easy to understand. ↑ The Queen of Great Bliss of Long-Chen Nying-Thig, translated by Tulku Thondup, Gangtok, 1983 revised 1992, p. 1.